When you hear some fans talking you would think that they’d never watched a match before, we’ve seen a lot of good players at Newcastle over the years, as well as even more rubbish. Some people who were raving about Cisse last season are now questioning his ability after half a dozen Premier League matches when he’s failed to hit the target. “Like all strikers you just want him to be getting chances and he (Cisse) is still getting them. When they don’t start threatening the goal then you start to worry but I don’t really sense that with Papiss”. 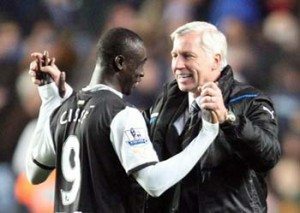 It’s easy to overlook as well that Cisse has scored a couple of goals against Bordeaux and Manchester United in the cups. On Thursday as well I didn’t think he was doing an awful lot wrong, apart of course from putting the ball into the back of the net! His movement in the box was really good and regularly lost his marker, with one example summing up his current situation. A cross was floated into a congested box but he lost his marker to get the chance to chest the ball down, then moved it expertly away to give him the shooting angle…then sliced it well wide. It is only a matter of time before that last element comes back and he’s knocking them in, 50 goals in his last 86 league matches suggests that form is temporary and class will be permanent.